The stellar corpse, called SGR 1900+14, belongs to a class of objects known as magnetars. These are the cores of massive stars that blew up in supernova explosions, but unlike other dead stars, they slowly pulsate with x-rays and have tremendously strong magnetic fields. "This magnetar is still alive in many ways," said Enrico Ramirez-Ruiz, assistant professor of astronomy and astrophysics at the University of California, Santa Cruz. "It is interacting with its environment, making a big impact on the young star-forming region where it was born." Ramirez-Ruiz is coauthor of a paper about the findings in the May 29 issue of Nature. The lead author is Stefanie Wachter of NASA's Spitzer Science Center at the California Institute of Technology, Pasadena. "The universe is a big place and weird things can happen," said Wachter, who found the ring serendipitously. "I was flipping through archived Spitzer data of the object, and that's when I noticed it was surrounded by a ring we'd never seen before." Wachter and her colleagues think that the ring, which is unlike anything ever seen before, formed in 1998 when the magnetar erupted in a giant flare. They believe the crusty surface of the magnetar cracked, sending out a flare, or blast of energy, that excavated a nearby cloud of dust, leaving an outer, dusty ring. This ring is oblong, with dimensions of about seven by three light-years. It appears to be flat, or two-dimensional, but the scientists said they can't rule out the possibility of a three-dimensional shell. "It's as if the magnetar became a huge flaming torch and obliterated the dust around it, creating a massive cavity," said Chryssa Kouveliotou, senior astrophysicist at NASA's Marshall Space Flight Center in Huntsville, Alabama, and a coauthor of the paper. "Then the stars nearby lit up a ring of fire around the dead star, marking it for eternity." 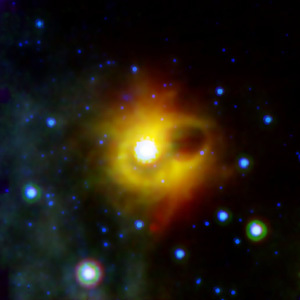 The discovery could help scientists figure out if a star's mass influences whether it becomes a magnetar when it dies. Though scientists know that stars above a certain mass will "go supernova," they do not know if mass plays a role in determining whether the star becomes a magnetar or a run-of-the-mill dead star. According to the science team, the ring demonstrates that SGR 1900+14 belongs to a nearby cluster of young, massive stars. By studying the masses of these nearby stars, the scientists might learn the approximate mass of the original star that exploded and became SGR 1900+14. "The ring has to be lit up by something, otherwise Spitzer wouldn't have seen it," said Ramirez-Ruiz. "The nearby massive stars are most likely what's heating the dust and lighting it up, and this means that the magnetar, which lies at the exact center of the ring, is associated with the massive star-forming region." Rings and spheres are common in the universe. Young, hot stars blow bubbles in space, carving out dust into spherical shapes. When stars die in supernova explosions, their remains are blasted into space, forming short-lived beautiful orbs called supernova remnants. Rings can also form around exploded stars whose expanding shells of debris ram into pre-existing dust rings, causing the dust to glow, as is the case with the supernova remnant called 1987A. But the ring around the magnetar SGR 1900+14 fits into none of these categories. For one thing, supernova remnants and the ring around 1987A cry out with X-rays and radio waves. The ring around SGR 1900+14 only glows at specific infrared wavelengths that Spitzer can see. At first, the astronomers thought the ring must be what's called an infrared echo. These occur when an object sends out a blast wave that travels outward, heating up dust and causing it to glow with infrared light. But when they went back to observe SGR 1900+14 later, the ring didn't move outward as it should have if it were an infrared echo. A closer analysis of the pictures later revealed that the ring is most likely a carved-out cavity in a dust cloud, a phenomenon that must be somewhat rare in the universe since it had not been seen before. The scientists plan to look for more of these rings. The paper's coauthors include V. Dwarkadas of the University of Chicago; J. Granot of the University of Hertfordshire, England; S.K. Patel of the Optical Sciences Corporation; and D. Figer of the Rochester Institute of Technology in New York. NASA's Jet Propulsion Laboratory in Pasadena manages the Spitzer mission for NASA's Science Mission Directorate. Science operations are conducted at the Spitzer Science Center. Caltech manages JPL for NASA. Spitzer's infrared array camera, which made the observations, was built by NASA's Goddard Space Flight Center, Greenbelt, Md. Its principal investigator is Giovanni Fazio of the Harvard-Smithsonian Center for Astrophysics. For more information, visit the Spitzer web site.